Dawn Killian, Andrew Patterson, Maile Jewel. Mary Francis Folmar Killian exited peacefully at Scripps Green Hospital on December 21, 2014 in San Diego, California at the age of 62. Mary is survived by her companion Andrew Patterson of Lakeside, CA, her furry family Mac, Dreamseas Pearl & Dreamseas Pebbles, her daughter Dawn Renee Killian currently of Houston TX, her brother Clyde Folmar Jr. of Winnsboro, TX, and many friends. She is preceded in death by her husband Kenneth Kay Killian who died active duty while serving in the Air Force, her mother Vera Jean Kariga Folmar, and her father Clyde Folmar Sr.
Mary Killian was born on the side of the road in Alaska. She graduated from a US Military high school outside of Seville, Spain. She graduated from UT Arlington with a degree in nursing and moved to San Diego around 1980. 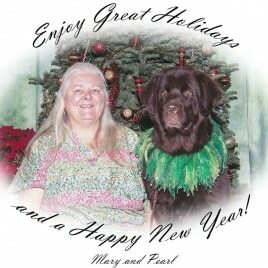 Mary may best be remembered for her innate love with dogs, her love of the Grand Canyon & abalone, and her sincere life purpose to help others live joyfully with their dogs. Mary was an accomplished registered nurse. She was an active volunteer with TDI and received accolades for her Therapy Dog volunteerism and other Newfie work. Her puppies were well placed and quality representations of the breed. Mary began her new journey with little awareness for completing this trip. While she was initially responsive after her stroke, she gradually slipped into an unresponsive mode over the next few hours. Her body was surrounded by her loving family of friends, companion and myself as her soul rose to drift on celestial winds. Mary was blessed to offer several anatomical donations, prior to her body’s cremation. Her joy in knowing her beloved furry companions are well placed will fuel her happy travel. Let me tell you of my mother’s departure. Mary was well loved among her friends. Grief and laughter were evident in abundance as well as encouraging joy for her grand new journey. Grief that we must stay behind to complete our own travel. Joy that she chose to move on with the freedom for greatest love, adventure and a place where dogs live as long as her next body. After consulting with the neurologist & other doctors & reviewing the progression of films. I felt calm in my decision to extubate and invite the body to expire. The universe conspired amongst itself to give Mary a send off as great as Bilbo Baggins Birthday. I invited her friends to chose as they needed to for their own health, inviting that they all might stay as the tube was extracted and machines removed or come and go to share in her send off. The room became very crowded as everyone there chose to stay. She faced the ocean, visible past Torrey Pines Golf Course. The curtains were opened widest. The room was imbued with a spectacular sunset, beginning just as her body was allowed it’s own functions. I placed a spring march, followed by spring dances of Tchaikovsky & other classical on Pandora. And scented the room with lavender. I told stories of how much Mary liked to travel. How my own lack of fear, stubbornness and joy of airplanes as well as loud fast cars, I had been given by her. How she ordered Betsy a Ford truck installed with 3 gas tanks and we spent a year traveling around Alaska… because she asked where I wanted to go and back then our visas to Russia were denied. I was 8. How brave and bold she was as a young widow to disregard the ‘safe’ ways and lead in exploring. Giving me a dictionary and a box of classics such as war and peace, little women, Machiavelli prince…what 8 yr old can say such?! I spoke of her deep love, instilled in me for the Grand Canyon. How she never flinched when I caught Gila Monsters and asked to keep them. We even had young ones born, until returning them, once she learned they were poisonous. How she kept silent any mothers fear watching her child jump from the water fall of Elves Chasm or of knowing I was facing in to the white water of Lava Falls from the boat, front and center…laughing as I had no fear. Much of her died when my father did. And she made choices to ignore depression and other treatable maladies. Yet she gave as she could and this was much, as evident among those that drove in from other states!! My mother’s passing was shared and supported by those that loved her well in these last years. Her arms and legs and hair were held and touched by many hands whose hearts spoke aloud as some shared their story of Mary and thanked her. Time of death was announced at 5:30pm. The sky was tinged the deepest crimson, shot through with purple and black, over the timeless Pacific. the exercises the doctors asked of her. some point Mary was put on a ventilator. Angeles that evening to spend time with her. did not continue to breath on her own. dogs in the Grand Canyon. We will do that sometime next year. Today it is one year. One year since beginning the rest of life as an orphan. One year since boarding a jet to fly west and pull the plug. Releasing my mother’s spirit to greater adventures. One year since reviewing films and seeing her unresponsive body. Talking with doctors and seeing in to faces of her dear ones, as we each came to the realization the time for parting paths was now. Not next week. Not after the one coveted vacation. Not after reconciling differences or rediscovering the warmth of a shared hug. Not after making the changes leading to improved health. Time in this life had come due. Choices now no longer mattered to my mother. But those choices kept me anchored. How to donate her organs. How to dispose of her physical shell, when she left no written plans. How to best secure great lives for her furry family. How to manager her affairs when she left them in such a lurch. How to let myself be while in the middle; between the conflicting emotions of sorrow, rage, and grief, anger! This has been a year of ‘in between’. In between comfort that my mother is not suffering any pain and feeling overwhelmed with the depth of grief, so unexpected. In between relief that she didn’t linger and anger that she left her affairs in such disarray. In between the love of an already fatherless young child and the frustrated rage of the ever present teen that she left before ever offering an explanation, or even sharing stores of my father. In between marking tasks on my calendar and staying on top of the many things a only heir has to do and letting things slide in complete ‘don’t give a f* attitude. Feeling the daily anxiousness, heartache and tenderness and noticing how ephemeral the pleasures of life are, yet how unimaginable to think of living without the fragrance of the first cup of tea, the smile on a cats whiskers, the sweetness of your dog’s snuggle, or the rumble of a hot motor shimmering in the air. I’d like to be able to say, ‘everything is fine.’ Like me that statement is in between. True half the time and a complete lie, simultaneously. Everything is OK. Yet there are the days I didn’t make my bed, or even get out of it. Or ate things I know will make me sick, like an entire package of gluten free cookies for the entire day with no protein (more than once! ), Or the evening I purchased a fine bottle of whiskey because I liked the tin it was in – and tried to drink it – to discover that for me it taste like medicine! Other days, I was able to reconnect with the deep love of a young child for her mother and recall describing a wolverine I had been tracking to her, or the fact that she never flinched, no matter what prize I caught and proudly offered for her to keep (be it gila monsters, or kangaroo rats, or collard lizards, or a giant praying mantis.). Or to think about what my childhood veterinarian had told me; that everything my mother had become – was because of me. Heavy stuff! Revealing of her own deep love for me. Staying in this space and being OK, that’s a life skill we only learn after we need it. Realizing the judgement of ‘right’ or ‘wrong’ blocks the flow of our developing innate wisdom and that being genuine can mean feeling both love and anger as well as comfort and fear. Awareness of holding still in transition invites my solid opinionated self to crack and soften, inviting me to be uncomfortably aware of deeper flexibility available than what my mind wants. We read about the unenlightened chump, and even more about these eight steps, or this surefire meditation that led X being directly to illumination, yet there isn’t much written about the in between. It’s the in the middle; the state of transition where one is growing large enough to feel loving and strong while also feeling small and stingy and to simply smell the first cup of tea and keep going. Uneasiness invites room for neither pure nor impure and therein is the fertility for a rich life with the capacity for compassion and the capability to radiate loving kindness. The year wraps up the end of today. Life’s paradox continues. The picture is of an amazing first quilt hand sew and designed by a dear friend of my mother’s as her Christmas gift last year. My mother had received the package yet, like me held the inviting opportunity of the box, unopened. She never saw all the love her dear friend put into this creation. Yesterday, I hung this art in my living room. A dog friendly celebration of life for Mary will be hosted some time in the spring. We are thinking how much Mary would enjoy her friends gathering together to share a pot luck picnic while enjoying canine shenanigans at a park. Re-homing opportunities for pieces of Mary\'s fun Scottie and Newfie collectibles may be avaliable. At a separate time Mary and the dogs that have proceeded her will join the timeless landscape of the Grand Canyon. Details will be updated here. Healgrief has a memorial to share with you. https://healgrief.org/mary-killian-12212014/ We invite you to express condolences, share special memories and photos and light virtual candles to honor and celebrate the life of our loved one. We also invite you to share this with others who may want to be notified as well. You may do so by sharing the link or by clicking the “Share this Memorial” button from within the memorial itself.